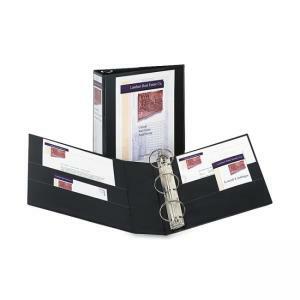 Avery Durable Reference View Ring Binder - 3 x Round Shape - 1"
Frequent-use binder is perfect for reference, proposals and presentations. EZ-Turn ring is designed for smooth page turning. Wide front and back binder panels fully cover standard dividers and sheet protectors. Gap-Free ring design prevents gapping and misalignment of rings. Pages lie flat with back-mounted rings. Design also features exposed rivets on back and two interior pockets to hold letter-size documents. Binder contains 40 percent post-consumer material.